Better together, our glass markers and stopper set are a match made in hosting heaven. Each set includes (6) themed silicone markers and (1) bottle stopper. Comes in a variety of styles for any occasion. 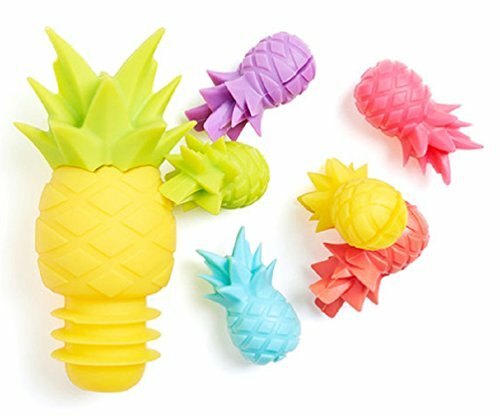 Markers and stopper are dishwasher safe and made from FDA approved food grade silicone. COMPLETE SET: Now you can finally plug your wine bottle and mark your glasses IN STYLE! Each set includes (6) themed silicone markers and (1) bottle stopper. Comes in a variety of styles for any occasion. HIGH QUALITY: Markers and stopper are made from FDA approved food grade silicone for purity, durability and ease of cleaning. DURABLE: Reusable and dishwasher safe, making these markers and stopper the perfect solution for function, style and fun for years to come! STAND OUT: With so much variety and color to choose from, you'll be entertaining your guests on a whole new level! THE PERFECT GIFT: You can be proud to gift this FUN set to any host and hostess you know! Help them ditch their boring markers and stopper, and entertain their guests in a new, innovative way! If you have any questions about this product by nod products, contact us by completing and submitting the form below. If you are looking for a specif part number, please include it with your message.